Bicyle Hoyle Edition. This Old Maid Card Game features 16 fun images of kids doing all the things that kids love! The game of Old Maid is a matching game - just don't caught with the Old Maid! 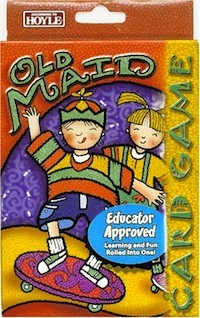 Includes easy to follow game rules for the new Old Maid card game. Fun for kids ages 3-6 and for the whole family. Kids learn simple matching skills, social interaction, and basic card playing skills. Learning and fun rolled into one!